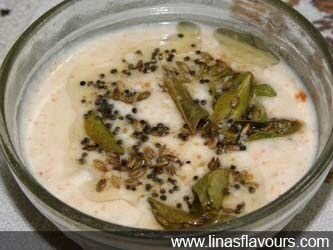 Take curd and mix garlic paste, salt, red chilly powder, coriander-cumin seeds powder and mix it well. Take pan and heat oil. Add mustard seeds, cumin seeds, curry leaves and switch off the heat. Pour this on to the curd. Instead of garlic paste you can even use garlic chutney.